Whew! It was a pretty hot week here. I’m looking forward to temperatures in the 80s next week. 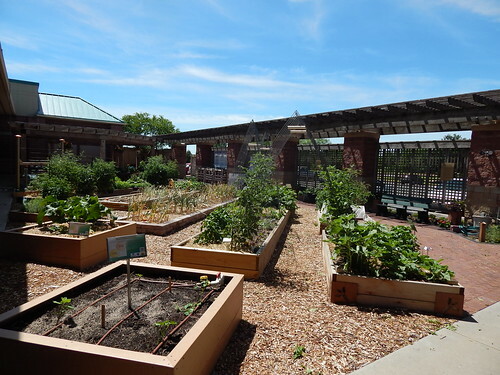 Let’s start out with our weekly overview of the garden. The front bed still looks pretty bare, but I bet that by a month from now the sweet potatoes will have completely covered the soil. Just for fun, let’s see what the garden looked like at the end of May. This is one of the pictures I took on May 31st. For one thing, the sky is sure a different color! In a month’s time, the garlic has gone from being the dominant feature of the landscape to being a faded remnant, while the tomatoes have turned into quite a jungle! It’s hard to see from this angle, but the eggplant are also quite a jungle. 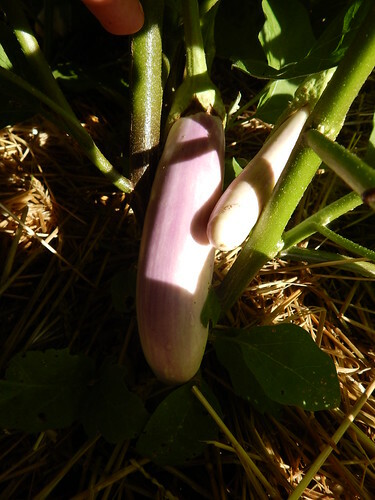 Speaking of Eggplant, this is the ‘Orient Charm’ eggplant. I apologize for the horrid sun and shadows in the picture. It was giving me fits this morning. this is the long, Chinese type that has a pink/lavender blush. The ‘Millionaire’ eggplant is already reaching the stage that I would term “quite prolific.” We harvested one on Tuesday and there’s another one ready today. I think by next Tuesday there will probably be several ready. We are going to need those eggplant recipes! 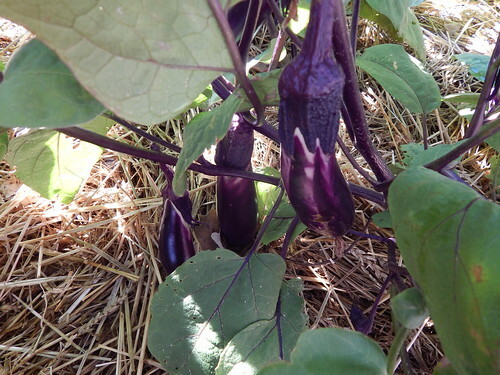 Once we get a few more plants producing, I’ll have a post about harvesting eggplant. Speaking of harvesting, I picked this small handful of green beans earlier in the week and found about twice this many today. By Tuesday it looks like there will be lots of green beans to pick! The purple ones don’t seem to have started producing yet. The parsnips have been looking a little bit strange, and on closer inspection yesterday it appears that they’ve got spider mites. 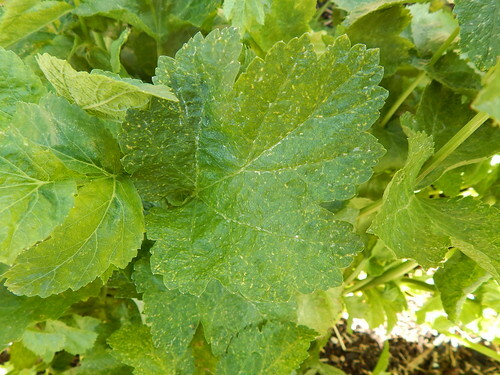 Who knew that parsnips get spider mites? This is why we try new things! Anyway, when I was watering yesterday (we are currently handwatering the parsnips because the garlic in the rest of the bed is in dry-down phase), I turned the water up all the way and blasted them good with a hard stream of water. That is one way to combat spider mites, and the undersides of the leaves look much cleaner today. We’ll probably have to either do that or spray with neem oil for the duration, since they will be growing until fall. This truss of Golden Honey Bunch tomatoes just keeps growing! (You should compare to the picture in last week’s photoessay!) How many tomatoes do you count on it now? 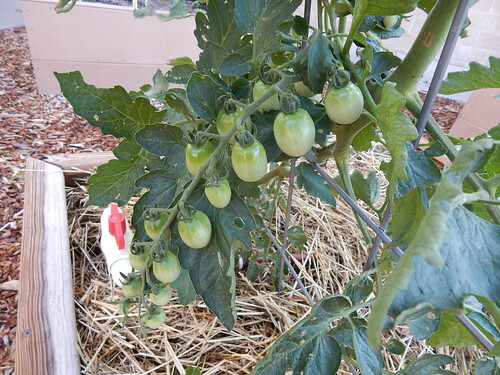 I’m wondering if they are going to ripen as a whole truss or if they will ripen one or two at a time. If the catalog pictures are to be believed, they should ripen as a group. 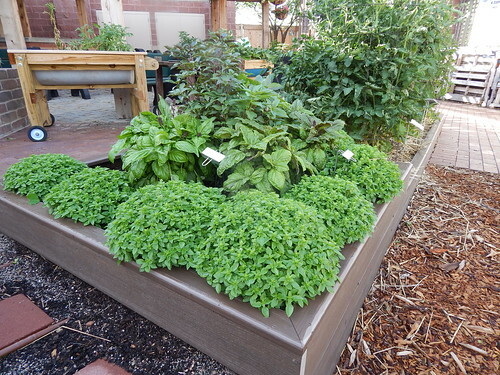 This is one of our two beds of basil. I love the perfect mounds and the pyramid shape of the plants. The only thing that would make it better is if the Red Large Lettuce Leaf Basils (the one in the middle tier) were as red as they are advertised to be. Oh well, we can’t have everything! 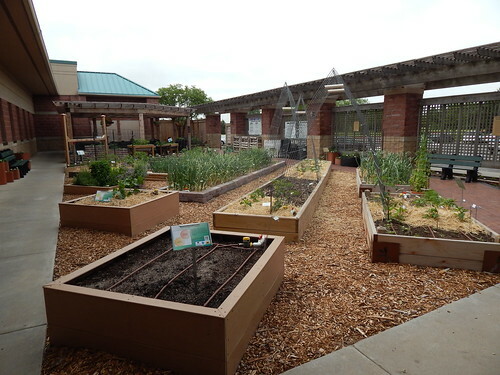 Posted on June 28, 2013, in PhotoEssays and tagged basil, beans, eggplant, herbs, insects, parsnips, Tomatoes. Bookmark the permalink. 2 Comments. I really enjoy your blog! I picked our first round of contender green beans a little over a week ago and they were great. Last week I picked the second round and they weren’t so good. About half of them had white stuff on the inside. The outside was fine. The meat of the bean wasn’t all green like it should be. I work full-time so I didn’t get the second round picked as soon as I would have liked but they really didn’t go that long. 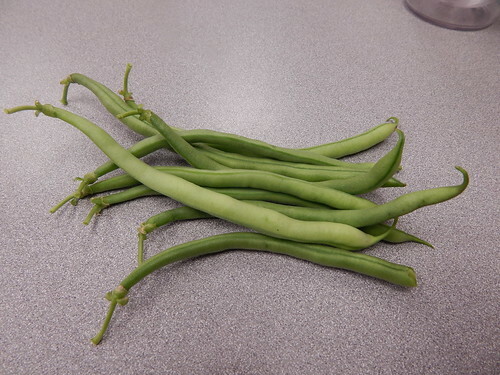 I’ve looked at pictures online of green beans with mold but most of them are white on the outside as well. Mine were not. Do you know what the white stuff is and is it harmful to eat the ones that weren’t so bad? I’m 45 miles north of you. Thanks! I wonder if the inside was just starting to get pithy from being on the plant a little longer. It would be strange to have a disease or mold inside the bean with no visible problem outside. You can send me an email with a picture or two so I can take a look at it.